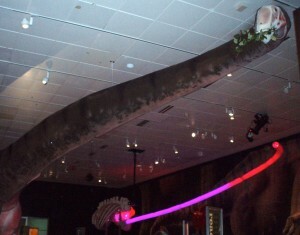 A 60-foot-long fiberglass model of a Mamenchisaurus dominates the central gallery of “The World’s Largest Dinosaurs” exhibit at the American Museum of Natural History. Poised on a pedestal, the 18-year-old female sauropod casually munches on a bunch of leaves as visitors marvel at how the snack traveled down her 30-foot-long neck. Her dimly lit right-hand side shows how her skin may have looked—a mottled gray-green pebbly surface with a fleshy pink underside—as she sauntered across present-day western China some 140 million years ago. However, the skin is peeled away from her left-hand side, illuminating areas where researchers envision her bones, veins, and muscles, as well as her reproductive and respiratory systems. The creature’s mechanically powered belly rises and falls with each lifelike breath. The Mamenchisaurus heart moved about 635 quarts of blood through its body. 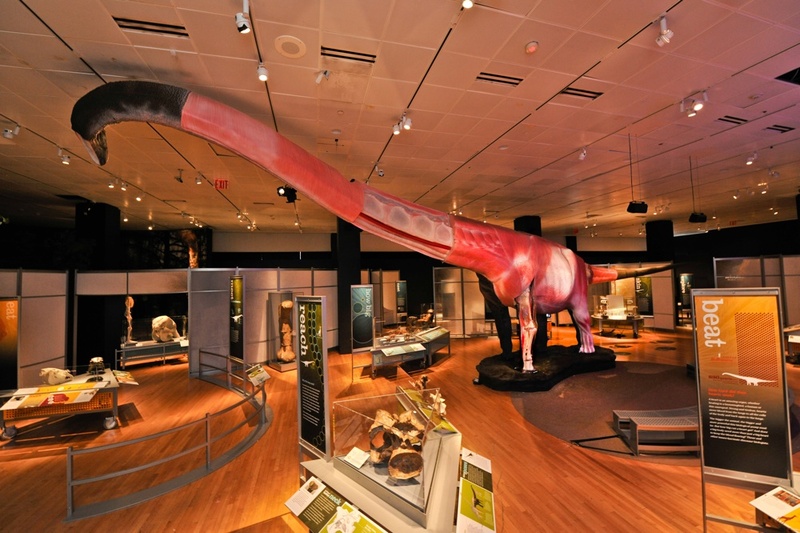 Through interactive stations surrounding the model, visitors absorb the latest factoids about the Mamenchisaurus: the lumbering animal didn’t sweat; it ate about 1,150 pounds of plant matter each day; and while its body weighed 13 tons, its head was only about 45 pounds. But I’m interested to learn more about the star of the show, the model that represents a smallish sauropod (some sprawled more than 150 feet). So I was lucky to sit down with her Canadian-based creator Hall Train, whose studio of the same name undertook the mega-size work of art. Hall Train Studios began planning the model in the summer of 2010. “The first thing was finding out as much as I could about the osteology of the animal,” says Train. So he pored over the latest research on the Mamenchisaurus by leading experts including Mark Norell, curator of the exhibit and chair of the AMNH’s Division of Paleontology. (Norell also later vetted Train’s artistic interpretations.) In a single weekend, Train came up with some hand-drawn sketches, which he later digitally enhanced with colors and details. Next he produced a giant poster showing the outside of the animal with the cutaway on one side and the skin on the other—Norell’s idea, he notes. By August, Train had started sculpting a small model out of a polymer clay; inside, he fashioned an elaborate and accurate internal structure of the creature made from socketed brass components. 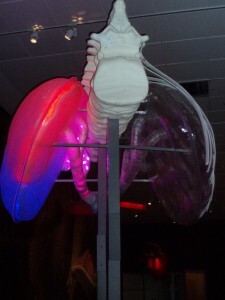 Using the small model, his team was able to isolate points where the armature would lie inside the life-size model and make a computer model from that data. On the digital model, they divided the dinosaur into 10 separate pieces—no single piece exceeding 12 feet in length—so that it would physically fit inside the AMNH’s gallery space. “Each side of the body comes apart like a big clamshell,” he says. The pebbly skin on the dinosaur’s right-hand side is Train’s chef d-oeuvre, based on a mathematical model made up of polygons that are five, six, seven, and eight sided. “They shift from one count to another and they’re very random,” he explains. “They get larger in some areas and they get smaller in others, and they get kinda squished and stretched.” The resulting realistic image was then mapped onto the computer model’s skin. The model is made up of 10 pieces so it can fit in the museum's gallery space. Although Train had an early interest in paleontology as a teenager, he began his career as an illustrator and then went into advertising. He eventually started a film company and produced and directed TV commercials for nearly a decade. “Then I got kind of sick of that,” he says. “One year I was down here in New York picking up some Clio Awards I’d won for some ads I’d made. The next day, I walked to this museum. I looked in and said to myself, you know, this is what I really want to do.” So about 15 years ago he undertook his first project for the AMNH, a film for the fossil hall that had just opened, and then others, including documentaries on dinosaurs. 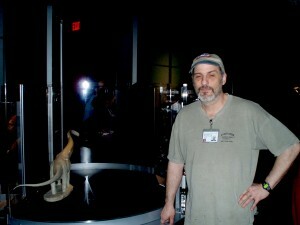 He’s been working on various AMNH projects ever since. Around the same time, Steven Spielberg hired him to work on Jurassic Park, and he’s also a production designer for Universal Studios to this day. 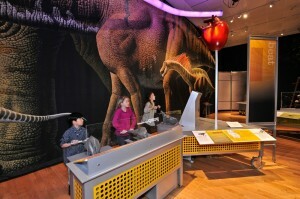 “The World’s Largest Dinosaurs” is on view at New York’s American Museum of Natural History through January 2, 2012. This entry was posted in Asia and tagged American Museum of Natural History, AMNH, China, Hall Train, sauropods, World's Largest Dinosaurs. Bookmark the permalink.